Leipziger Platz is an octagonal square in the center of Berlin. It is located along Leipziger Straße just east of and adjacent to the Potsdamer Platz. Leipziger Platz was reduced to ruins during the Second World War and was once part of the no man's land surrounding the Berlin Wall, but has since been reconstructed in its original configuration, albeit with modern architecture. 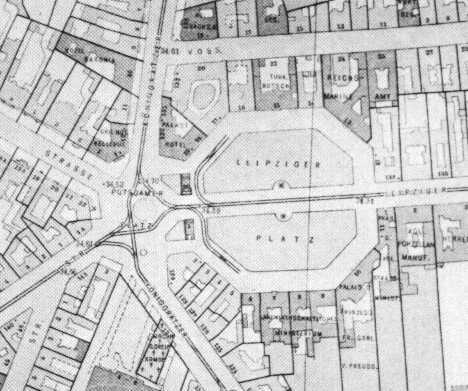 Prior to the war, the square was home to the Reichsmarineamt (Reich Navy Office, originally on Leipziger Platz 13, moved to No. 17/Voßstraße No. 20 in the 1900s), the Wertheim flagship department store (numbers 12-13), the Mosse-Palais (headquarters of the German publisher Hans Lachmann-Mosse, Leipziger Platz 15), Palast-Hotel (No. 18-19) and the Prussian Ministry of Agriculture (No. 6-9). Today, it is home to the Canadian Embassy and the American Jewish Committee. There is also a little piece of the Berlin Wall located in the southern half. 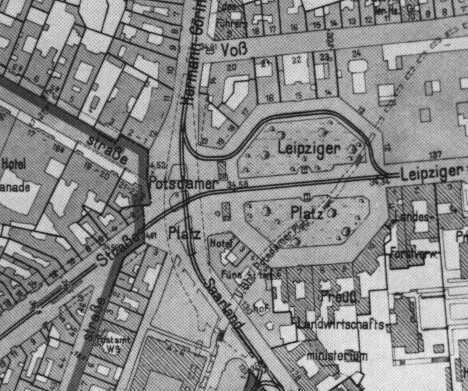 Wikimedia Commons has media related to Leipziger Platz. This page was last edited on 20 December 2017, at 10:42 (UTC).